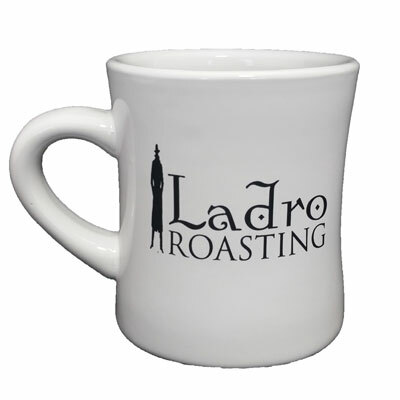 This heavy duty diner-style mug sporting the Ladro Roasting logo on two sides makes enjoying your coffee at home feel like a luxury. 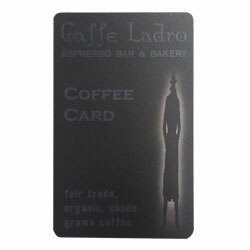 It's a treat you can give yourself every day. Why yes, it does come in black. From Angela Urbanek of Orland Park, Illinois on 4/12/2018 . thought the mug was a great idea. From Paula H of Scottsboro, Alabama on 2/9/2016 . My new favorite mug. Affordable & simply stylish logo. Great gift idea! From James Randall of Atascadero, California on 10/5/2015 . This diner mug is now my favorite. 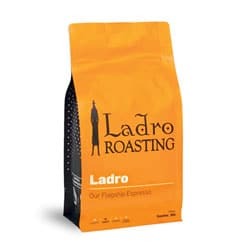 Generous size, and I love your logo. 3/9/2018 – Does the mug fit a full volume of an aeropress (inverted brewing method w/ full tube)? Also, does the diameter on the . . . 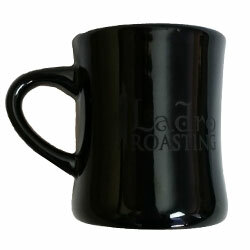 Response From Caffe Ladro: Yes, the Diner Mug will hold the full volume of an aeropress. Yes, the aeropress brewer does fit the Diner Mug. You would be able to press your coffee directly into the mug. Thank you for asking!